Twenty-five seasons of reporting the big story, such as the last federal election, the 7th since the inception of the NPU, whose 25 years have been under the liberal banner, save eight, has its share of awkward moments. The last thing Paul Martin did before ending 17 years of pursuing the highest office in the land was zip up. It was one of these awkward brushes with newsmakers that my life seems to be full of. Sensing his nearing the conference center on election night I rushed to the washroom to be able to tackle any possible outcome with utter comfort. As I was complimenting myself on my accurate targeting the empty washroom became swarmed with men with earpieces that I imagine shouldn't be allowed this close to the running water of male urinals. As I proceeded to the faucet I realized I was in the presence of prime ministerial greatness. Reaching for the empty paper towel dispenser I caught a glimpse of Paul Martin's back at the other end of the facilities, giving a rather rare performance in the confines of an open cubicle no doubt swept for bugs a moment before. His executive experience was obvious from the lack of any loud sounds of running liquid, which would surely have echoed in these spotless surroundings. He zipped up and turned to leave. Catching glimpse of me, in full awe, he smiled and left the room beaming. As I shook the aura of glamor something struck me. My eyes returned to the faucet I had so recently used. I had one of these out-of-body Seinfeld moments, a certain restaurant scene in which a chef uses the facilities before preparing a fellow urinating patron's meal. "Wait a minute" I thought. It later dawned on me he would shake hundreds of hands before making his way to the podium. Should they be warned? Would it be in breach of national security? As proof faux-pas can be terminal in politics, he went on to announce he would be stepping down as party leader within minutes. Why is my life rife with such awkward moments when meeting newsmakers? It started at a young age the day I met a childhood hero. Unfortunately hockey Great Guy Lafleur was naked when I was introduced to him during the world championships in a Swedish dressing room, a moment made for Ingmar Bergman movies. I tried to hide a combination of discomfort and fear of accidentally looking down but thankfully that encounter was innocent enough. Things started really going south when I nearly made headlines falling from a lamp-post during a Gorbachev visit. I was merely trying to get a rather unique photo shot. The Soviet leader saw me dangling there and smiled, amused at my inept acrobatics, and entered his Zlin limousine wondering what the locals were driking so early in the day. 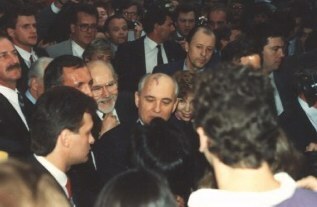 He was soon ousted from power by Yeltsin. 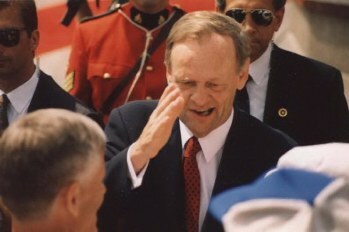 Then there was Jean Chretien who nearly tripped and stumbled when he ran to shake my hand during a very unofficial visit in Athens before he made PM. How would a decade of Canadian politics have turned out if he had? Would Queen Elizabeth II have broken her ties with Canada and made us a republic if I had actually knocked her over as I tried, in an ungraceful and unbalanced way, to snap pictures during a ceremony during which the war veteran I was accompanying was receiving full honors? 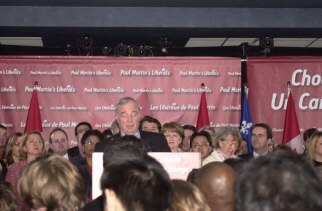 Separatist premier Lucien Bouchard was convinced that I knew him from somewhere at a downtown venue once. Distraught when I corrected him it must have been someone bearing my likeness he went on to quit politics the following year saying he didn't think sovereignty was possible for Quebec. The one who perhaps felt the full wrath of my sorry existence must have been now former foreign minister Pierre Pettigrew. There were no awkward moments, just a series of unfortunate events. One press conference I attended was delayed after a protester had doused the minister in fake-blood red. Fortunately it left his hair untouched. In fact during one street interview in December we got along rather well and he clutched my shoulder in buddy-buddy fashion at the end of the interview. Weeks later however he was nearly mugged trying to make a cell phone call from a subway stop close to my house. Weeks after that, his constituents fired him. Imagine the damage if he had been more than minister. It is at times like these I relish my anonymity. Let it be clear, I refuse to be the Forrest Gump of my generation, shattering the world by taking a whiz. Poor Paul Martin didn't know who he was running into. He didn't stand much of a chance. Neither did his dad however. The three-time failure for the leadership race of the liberal party had made some odd choices choosing his staff. He was my dad's superior for many, oh how many years. Having a story flagged is a great worry to editors. That such flagging should result in the severe alteration of a story requires nerves of steel and crystal clear understanding about the needs for taking such action, which can appear to serve as an alarming precedent. In the history of the NPU this happened once in the Spring of 1987 as Nordic was in the midst of reporting on the carrying out of negotiations in the controversy surrounding possible oil drilling off the shores of Greece. In a bold move criticised by the Canadian government, Greece unilaterally set out to take over the North Aegean Petroleum Company, a consortium of companies in which Canada had a large stake. 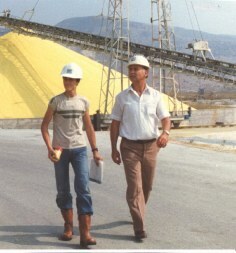 NAPC, which was majority-owned by Denison Mines until 1998, was responsible for Greece's only indigenous source of crude oil, a production nowhere near the country's energy needs, and slipping since. It owed a 68.75% of the stake at the time and operated an oilfield the government considered of "strategic importance", but wasn't about to willingly sell its interest, something it only did your years ago. The government wanted 51% of the stake, one which represented one of the largest foreign investments in Greece. Not only did the move inflame Canadian passions, it set off alarm bells in nearby Turkey as well, which charged Greece was not respecting international law on the continental shelf under the Aegean sea. The hotly contested seabed has been a point of contention between the two Mediterranean rivals, and possible Greek plans to drill there would contravene a 1976 International Court of Justice ruling that determined the Aegean continental shelf beyond the territorial waters of the two littoral states, as "areas in dispute", where both Turkey and Greece claim rights of exploration and exploitation. Subsequent to the International Court of Justice ruling, Turkey and Greece signed the 1976 Bern Agreement settling the dispute for some years, the two governments refraining from any initiative or act involving the Aegean continental shelf. But in the 1980s such "initiatives" were bringing both countries at odds, sparked initially by the innocent surveying of a Turkish oceanographic vessel in the north Aegean, and culminating in the cold days of February 1987. The crisis evolved into a severe diplomatic one, as the two countries threatened to wage war over control of the Aegean. Caught in the middle was Canada, which was feverishly determined to calm the crisis and defend the interests of the company. The embassy erupted however, when Greek officials, in only their latest misconceived statements, told the press the Canadians would hold a conference unless its ambassador met directly with the prime minister, who had more than once been embarrassed by his underlings by then. The story was soon making headlines on the cover of local newspapers as what should have been a business story turned into one of diplomatic proportions, with both Greek and Turkish passions whipped up in the process. 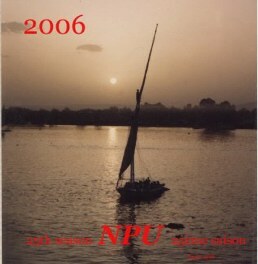 Because the story had cancelled vacation plans at the NPU weekly, it soon whipped up passions at the editorial level there as well. Nordic ran weekly stories, some of them openly criticizing the Greek government's actions, and words (Athens considered the Canadian stake in the company a "colonial" contract made by previous governments). An exclusive inside story in the works promised to make up for the foiled plans. In it, the dealings of Canadian officials, which had publicly condemned the position of the Greek government and the statements of its officials, was described with great detail. The who met whom and when's of the story painted a clear picture of Canada's efforts to avoid a crisis and protect its interest. By the time a draft copy of the story came out, with the unmistakable headline of "Canada attacked", it had sparked concerns at the Canadian mission. Officials were worried the timing of the story, and delicate content, would inflame an already tense situation in which it already had its share of flames to douse. Nationalistic but soon aware of the situation it could create if the story was picked up in the passionate local press, the NPU pulled the story with great reluctance. It had obtained the assurance of Canadian officials they would provide other exclusive material, by press time, to fill the space. Thankfully, and incredibly, the story wasn't running on the cover, which made it easier to fill the blanks with two pictures of press and Canadian officials touring the facility of the company at the centre of the controversy earlier in the year, with a caption which did not conceal the initial grumblings of the editorial board. Under the title "We knew too much", the accompanying text made clear the NPU had retracted an earlier story in the interest of diplomacy and the resolving of the crisis, one of many times Greece and Turkey found themselves, as the Athens papers reported, "on the brink of war". Having been close to the brink and back, both countries soon initiated the spirit of Davos, encouraging closer ties and contacts between the two countries' leaders. It was years again before similar fears surged anew, in 1996, when another close call in the Aegean threatened to reignite the flames. As for the Nordic story, the headline alone showed necessary tweaking had been in order, even for a paper whose patriotism was never in question in the Ben Johnson and Canada Cup era. The NPU had decided it could be a patriot by serving its country's diplomatic efforts. But the incident, the only one of its kind for an agency whose affiliated publications didn't mind writing about sexual education for high-school audiences, remained one editors have not forgotten. Years later, in the interest of history, the decision was made to print to story, but by then, and many office moves later, it had disappeared. The article could in fact never have surfaced for security rather than diplomatic reasons. When the original copy of the February 1987 issue was finally put together and sent to printing, it was nearly destroyed by accident. The suitcase that carried it was left unattended for a few minutes and found by security guards who feared it may have been a bomb. They nearly blew it up, along with its contents, in the name of security. 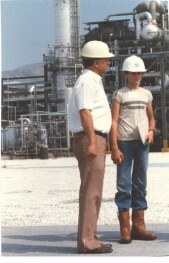 According to the Denison web site, in November 1998 production ceased from the oil and gas fields in northern Greece. All interests in the wells, production platforms and processing facilities associated with these fields were transferred to the Greek state in exchange for the state’s assumption of all associated decommissioning liabilities. The company soon after increased its stake in in the offshore operation however. 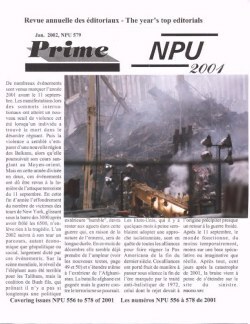 (14-15 février 1987, NPU 207) - Les articles rassemblés et tapés, les illustrations trouvées et collées, le feu vert annoncé, il ne restait plus qu'à exposer. La fin de semaine dernière a été particulièrement exténuante à la NPU. Après l'hebdomadaire usuel (NORDIC) à taper et mettre sur l'étalage, il fallut immédiatement travailler sur la toute première édition de la Chaussette Hongroise, qui devait sortir le jeudi suivant; il n'y eut aucune modification au programme. Aussi restait-il une foule de choses encore à faire: le raisin arraché devait être nettoyé puis traité pour être pressé et embouteillé "Février 1987". Puis vint s'installer l'anxiété, lorsque vint le temps de faire tirer les 800 pages nécessaires pour cette première parution limitée à 100 exemplaires. Il n'était pas question de problèmes financiers mais plutôt de manque de temps, qui se rétrecissait à une allure folle tandis qu'on cherchait toujours une bonne maison d'impression pour s'occuper des copies. Le problème technique une fois réglé, il restait quand même des centaines de pages à trier et assembler. La première section du magazine attendait patiemment dans les locaux de la NPU avant d'être transportée au centre-ville pour la dernière retouche le mercredi, où les éditions allaient être parées pour la mise en vente à l'établissement scolaire franco-hellénique d'Athènes, le jour suivant. A 15h20, le transfert eu lieu, et les deux directeurs du journal indépendant, <<clandestin>> de l'établissement, dont le président de la NPU, s'installèrent aux bureaux du centre-ville pour assembler de manière <<tayloriste>> environ 100 copies de la première édition. Puis l'équipe poussa un air de soulagement, puis un soupir inattendu: <<dommage qu'il faille que tout disparaisse>> dit-on en contemplant les piles de copies fraîches prêtes à être vendues, gratte-ciels impressionnants de papier et d'encre. L'effort conjoint des directeurs de la NPU et des MOTS SIMPLES allait vite être reconnu par la masse lectrice. Ce tout premier (et sûrement pas le dernier) numéro une fois terminé, toutes les heures de travail touchaient maintenant à leur prime. Le deuxième numéro, comme se veut la tradition à la NPU où l'information et les idées roulent si vite, était déjà tout frais dans la tête des éditeurs, mais la NPU avait bien montré que concrétiser ces idées était bien plus éprouvant: 24 heures en une fin de semaine avaient été ajoutées au travail habituel pour s'assurer à une parution sans délai, soit le 12 février, un mois après l'anniversaire du président de la NPU, et une semaine après le 5ème anniversaire des presses. Champagne au frais, mais en attendant, atteindre le but de liquider les stocks de la première édition pour pouvoir passer à la suivante: 30% des stocks vendus le jour de parution, 10% encore le lendemain, malgré un temps limité alloué aux vendeurs le vendredi. 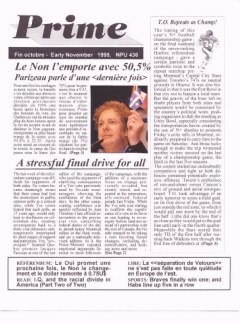 Le président de la NPU s'était battu pour faire paraître le numéro le plus tôt possible, en fin de semaine; un moment où les portefeuilles sont souvent vides. Mais il était ici nullement question d'argent, mais de prestige, de première, et d'exploit technique. On attend quand même le lundi avec impatience. Les professeurs de l'établissement exprimèrent un intérêt inhabituel, et les élèves étaient prêts avec leurs 35 drachmes (35 cents à l'époque); le sentiment éprouvé en voyant autour de soi, dans une véritable foule, tant de copies de la CHAUSSETTE était inexprimable; un spectacle d'une étonnante envergure. À la surprise de tous, tout s'était bien passé lors de la visite chez le censeur, qui devait approuver la parution massive dans l'établissement. Le protocole valut aux éditeurs une contribution, pour lancer un magazine qui allait conserver un certain caractère <<clandestin>>. Le premier marché visé, celui des classes supérieures, méritait 80% de l'attention des vendeurs. Il faut dire que l'anticipation n'avait pas fait défaut. Puis on se pencha sur les autres institutions à Athènes susceptibles de faire passer le message, un effort symbolique mais quand même valeureux. 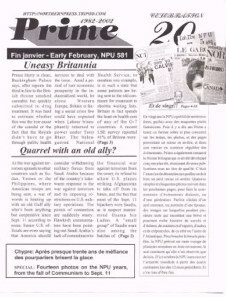 Décidément, la première édition du journal, la CHAUSSETTE, avait <<fait>> à merveille (titre NPU 208). Les critiques louèrent entre autre la forme et la présentation du magazine (un point important à la NPU), l'esprit humoristique (rien qu'à voir la couverture) du journal, et l'imagination des auteurs. Le succès commercial du premier numéro, aidé par les contributions, a élevé le revenu par journal vendu de 35 à 40 drachmes selon les éditeurs, un premier pourboire dans l'histoire de l'édition, aidé par un manque de petites pièces. Jour 1: 38 Dr au numéro, J-2: 41.5 Dr avant de baisser dans les 39-40 Dr. Le prochain numéro voit déjà grand: un interview d'Yves Duteil, chanteur, et possiblement Carl Sagan, écrivain. Et ce ne sera pas tout! Mais la compétition s'annoce de taille: le journal officiel, appuyé par l'établissement, visera les 800 exemplaires, donc la moitié des lecteurs potentiels! Un peu plus d'un an plus tard, la Chaussette débarquait à Paris, ou lors de son premier concours elle remportait une mention spéciale dans les pages du prestigieux journal Le Monde. The Turin Games are barely over that Canadians can only dream of going one better on the hockey front: winning the gold at home. Recently Whistler, BC was officially endorsed to represent Canada's bid for the 2010 Winter Games. After two failed attempts to win the summer games for Toronto, Canada may have its best chance yet to bring the games of hockey and speed skating back home in eight years. That would mean another cross-country journey of the flame plucked from Olympia, and a trip to Greece by the proud mayor of a Canadian city. 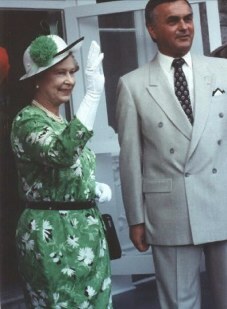 In 1987, the year before the Calgary Games, it was (now Alberta premier) Ralph Klein's turn to make the trek. 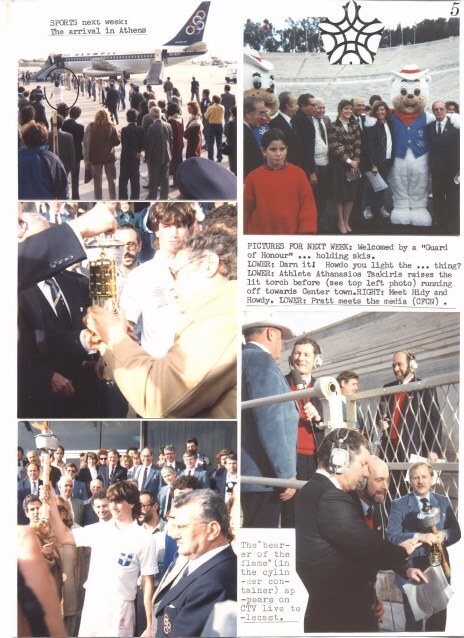 In this instalment of 20th anniversary RETRO, the NPU recalls its privileged visit to Olympia in the Fall of 1987, as the Olympic flame made its first miles out of historic site and towards Calgary. The Albertan city was preparing to host the XVth Winter Olympics, the younger sister of the Summer games but the ones that mean everything to a country of snow and ice. They would involve some 1,500 athletes from 52 nations in a Western city of 700,000 according to the mayor's own figures, reciting the figures as he trekked from Athens to Olympia on a Challenger jet with a delegation including the Canadian ambassador and William Pratt, a cowboy-hat wearing president of the Organizing committee. 9,000 volunteers and $114 million of Alberta's own money (not to mention NBC's own $309 million) would contribute to make this, in the mayor's own words the "world's biggest party ever!" since "Nobody knows how to throw a party like Calgarians". Something that rings true everytime the Stampeder fans invade a Grey Cup city. Olympic Oval, Nordic Center and Olympic Park promised to come alive once the 620-foot Calgary tower was ready to receive the flame of the Olympiad, but only after an 88-day 18,000-mile cross-country trek (the longest tour ever) that would begin on historic Greek soil. 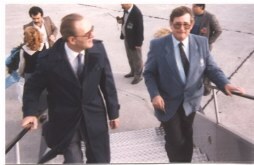 The delegation, which included an NPU reporter, a representative from Petro-Canada, Andre Bombardier, former athlete Roger Jackson, the Korean ambassador and other personalities (there would eventually be a cameo appearance by Greek celebrity Melina Mercouri) first engaged on the journey from Athens' East terminal. After a few organizational hiccups and a stop at Andravida army base, the party made its way to the curvy International Olympic Academy, on the threshold of one of the world's most prestigious archaeological sites, the ruins of Olympia. After a leisurely stroll through the greenery, the party, now joined by Canadian and local media, made its way to an opening where three flag poles towered over a ceremonial altar. The gathering once divided between tourists and officials, the ceremony was under way. 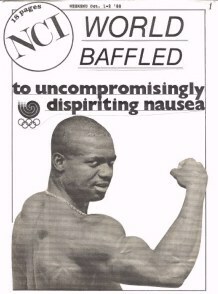 "The Olympic celebration every four years goes beyond the development of the body," suggested Pratt in one of two speeches, faintly heard in the back due to a poor speaker system hidden among the trees. Soon the sun-lit flame appeared in the hands of a woman dressed in white robe, who placed the flame on the altar, surrounded by similarly-dressed women kneeling on one knee, an invocation to the gods. A male athlete in white shirt and shorts soon approached, claimed the now lit torch, and swiftly jogged out of sight. As the officials mingled, Klein received a special edition bottle of Demestica Greek wine, an official '88 Olympics sticker on the label, a present from Canadian tourists who magically appeared from nowhere. 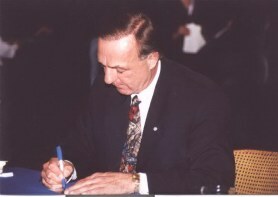 Like the scheduled planning, the ceremony was short on accuracy, as Pratt became known as "Platt", and the Canadian ambassador referred to as "president". The blunders certainly reached the buffet awaiting the party at the military base, unsatisfying to say the least. Back in Athens, where the flame was flown in a tube-shaped brass and glass container (in duplicate), a ceremonial guard bearing skis awaited the return of the party. After some time struggling to light the torch anew, it was eventually carried away by Athanasios Tsakiris, who promptly headed to the center of town. The athlete, the NPU learned, is considered by Greece's sports undersecretariat as one of the country's greatest ski athletes, having competed in biathlon and cross-country competitions. In the 20K cross-country competition he finished 65th in Nagano, the last Games he took part in. He was still participating in international ski competition as of last year according to our records. The Calgary '88 ceremony eventually ensued in the city's fabled marble stadium, where the first games took place in 1896, and where ceremonies will return two years from now, Greek preparations eventually permitting. That will be the shorter trip the flame will have made in decades, leaving its site of origin, near the Temple of Zeus. But the flame will be traveling beyond continental Greece, to its islands, including Cyprus, divided between Turks and Greeks since 1974. In a recent visit to the island, the president of the Athens 2004 committee expressed his desire that the Cypriot portion of the Olympic trail would "be a symbolic reminder of what should be uniting us and of what we should not allow to divide us." The Games never seem to stray very far away from politics, whether through poor judging or controversial torch relays.